Education is what’s left after you’ve forgotten what you learned in school, Albert Einstein said. Curiosity and learning how to learn — what some call being a master learner — are far more powerful indicators of success than a choice of major. A specific field of study might just be a stepping stone to something else. Only 51 percent of college graduates working said their job is related to their major, and 32 percent said they never worked in a field related to their majors, according to a pair of surveys by CareerBuilder. As crushing as that might sound right now to students immersed in differential equations or thesis wrangling, it’s not the end of the world. In fact, it might be the beginning of a whole new one. 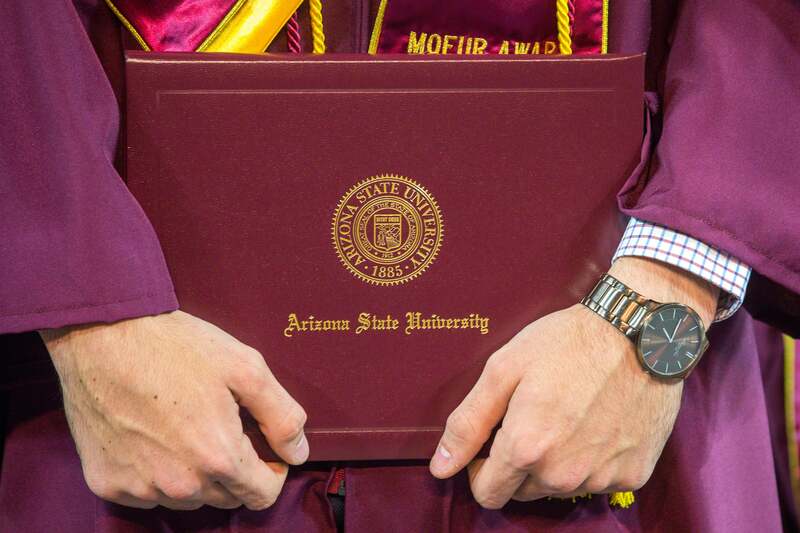 Three of Arizona State University’s most accomplished faculty members aren’t doing what they set out to do, and they couldn’t be happier or more successful. Rolf Halden is an engineer who practices chemistry. Phil Christensen is a planetary geologist who engineers instruments. Randy Nesse is a psychiatrist who studies biology. Curiosity carried all three of them away. They more or less fell into what they do now. Halden has a bachelor’s degree, two master’s degrees and a doctorate. He is the spokesman for the American Chemical Society, but of those four degrees, not one is in chemistry. Christensen has four instruments in space and three more slated for flight. Nesse became curious about evolutionary processes when he was a professor of psychiatry at the University of Michigan. He asked some biologists a few questions about evolution. They laughed at him. Halden began his career studying zoology and botany in Germany. “Then I looked at the job market and found there are not a lot of jobs in that area,” he said. He specialized in microbiology, biotechnology, and sanitary engineering as a second elective, and earned his diploma. “Even with those changes, there wasn’t a lot of opportunity,” Halden said. He rebooted as an engineer by leaving Germany and studying civil engineering in the U.S. However, “neither engineering nor biology work well if you don’t have a good understanding of chemistry,” he said. Halden always liked chemistry. When he started working in engineering, he worked on dioxins, cancer-causing agents that pollute groundwater and soil. He was in soil remediation, looking at how to move these carcinogens, using microorganisms that are supposed to gobble them up. In order to see what worked, he had to extract chemicals from soil and analyze them with tools like high-resolution mass spectrometers. Halden is a board-certified professional civil engineer, but he runs a mass spectrometry facility and is one of the experts for the American Chemical Society. “They have selected me as a spokesperson to best represent their science, although I don’t carry a degree in chemistry, which is a bit bizarre,” he said. Christensen was always interested in geology. When he was in high school, he watched the moon landing and became intrigued with space. He got a degree in geology. During his senior year at UCLA, he worked for a guy who was building an instrument to go on a NASA mission to Mars. Christensen went on to earn a doctorate in planetary geology. Christensen called up an engineer he knew through his adviser and said he wanted to propose an instrument. Christensen went out to the Santa Barbara Research Center, became a lead scientist and proposed an instrument. “To everyone’s amazement, including my own, NASA selected that instrument to go on a mission,” he said. That was in the late 1980s. For years, Christensen worked with the center, as a scientist working with engineers who did the hardware. Then he got a new bug. Instead of telling engineers what kind of measurements he wanted to make and what kind of data he wanted to collect, he wanted to be involved with the building and design. Jump forward 20 years. The Santa Barbara company closed down. ASU wanted to build more capability on campus. About five years ago Christensen suggested hiring some of the engineers to come work for him at ASU. There are some pitfalls to avoid when transitioning from one field to another. Halden has a long and distinguished track record — his resume is 67 pages — of chasing chemistry through food and water and soil into people, but he is humble. Christensen’s progression went from being interested in the science to wanting to use science data to wanting to get his own science data to wanting to build the instruments that get that science data. Now he builds instruments to go to strange places like asteroids and Jovian moons and study strange objects. A lot of people in school right now will ultimately perform in a job that doesn’t even exist or for which there are no training programs, Halden said. Nesse, a professor in ASU's School of Life Sciences, said he doesn’t consider his path as switching fields.